We continue this month’s focus on Piedmont with a look at the top three Roman sites in the region. With its north-western location, Piedmont was in a strategic position to control the populations who may be pushing in from just beyond the Alps. The Romans arrived in Piedmont in the 2nd century BC and established several colonies, including Eporedia (Ivrea), Derthona (Tortona), and Augusta Taurinorum (Turin), founded in 28 BC during the Gallic Wars waged by Julius Caesar against the Gallic tribes. As with everywhere they went, the Romans left signs of their passage with incredible constructions that have withstood the passing of time: aqueducts, bridges, roads, arches, walls. We have selected three of the most significant Roman monuments you can see in Piedmont. In the heart of the Susa Valley, at the foot of the Cottian Alps, 51 km (32 mi) west of Turin, is Susa, which became part of the Roman empire in the late 1st century BC. It was the capital of the Alpes Cottiae, one of three small provinces of the Roman Empire straddling the Alps between France and Italy. Remains of the Roman city have been found in Piazza Savoia, the city’s central square, which was the site of the Forum. Porta Savoia for example, right next to the Cathedral, is one of the most significant examples of Roman military architecture in the area. It was the main access to town. Porta Savoia is part of the well-preserved Roman walls built between the 3rd and 2nd centuries. Other Roman sights include the 2nd-century AD amphitheater, built in a basin sheltered by the winds of the valley; and the remains of the aqueduct, known as Terme Graziane. 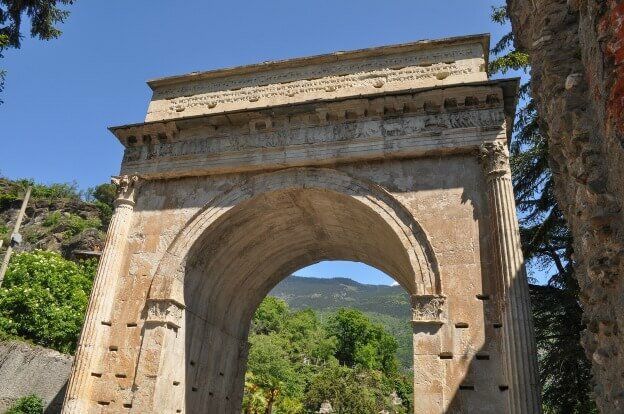 But the most impressive Roman monument of all is the triumphal Arch of Augustus, built at the end of the 1st century BC to mark the alliance between Emperor Augustus and Marcus Julius Cottius, a Celtic-Ligurian ruler (before the Romans, Piedmont was inhabited by Celtic-Ligurian tribes) made king and Roman prefect of the Cottian Alps. Octavian Augustus himself, returning from Gaul, stopped in Segusium (the Roman name of Susa) to inaugurate the monument. The arch is located on a small hill in the western part of the city, near where the walls would later be built. It was positioned along the Via Cozia (today known as Via delle Gallie), the road that led to Gaul. Less than an hour north of Turin, Ivrea is the main center of the so-called Canavese subalpine area, located on the road leading to the Aosta Valley, part of the medieval Via Francigena. Traversed by the Dora Baltea river, a tributary of the Po, Ivrea and the surrounding territory are especially famous for the numerous castles. Ivrea itself is a popular destination during the Carnival period, as it hosts one of Italy’s most famous Carnevale, with its signature Battle of the Oranges. Ivrea became an outpost of the Roman Empire in 100 BC, when it was founded to guard one of the traditional invasion routes into northern Italy from the Alps. It was then known by its Latin name, Eporedia. Archeological excavations have brought to light the remains of several Roman buildings, a road and the sewer system. The best preserved Roman site is the amphitheater from the 1st century, which could hold up to 100,000 spectators. Built outside the town’s walls, along the road to Vercelli, the amphitheater extended for a length of about 65 meters; you can still admire the remains of the elliptical outer perimeter wall and the side walls, as well as some underground tunnels where the animals were kept, and the tunnel that allowed the passage of the gladiators from the stands into the center of the amphitheater. Located in the province of Alessandria, in the southern part of Piedmont, Acqui Terme is one of the main winemaking communities of the Italian DOCG red wine Brachetto d'Acqui. Acqui Terme is also a popular spa town, as hinted by the name (terme is thermal baths). In the center of town stands La Bollente (the hot one), a small pavilion designed in 1870 housing a hot, natural spring fountain where the waters bubble at 75°C. The hot sulphur springs have been famous since Roman times, when Acqui Terme went by the name of Aquae Statiellae; they were mentioned by Latin writer Gaio Plinio Secondo as the most important of the Roman world, along with those in Puteoli (Pozzuoli) and Aquae Sextiae (Aix-en-Provence). The importance of the Roman city grew with the construction in 109 BC of the Æmilia Scauri road, which, in Imperial times, was renamed Via Julia Augusta and became one of the major ground connections between the Po Valley and Gaul and Spain. Acqui Terme was equipped with at least three thermal baths; the remains of a calidarium pool can still be seen today. A monumental aqueduct ensured the supply of water for both thermal uses and domestic/business ones. It is indeed the aqueduct the most significant Roman site in Acqui Terme. 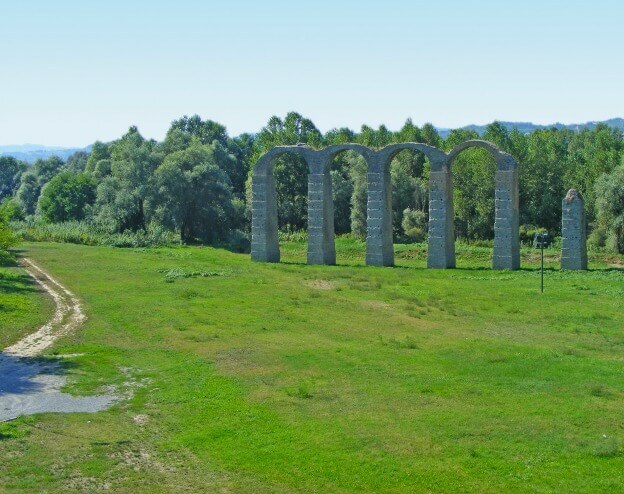 Consisting of 15 pillars and 4 arches, the aqueduct, one of the symbols of the city, is one of the best preserved structures of its kind in northern Italy and dates back to imperial times; the pipeline was originally 13 km long and drew water from the Erro stream. 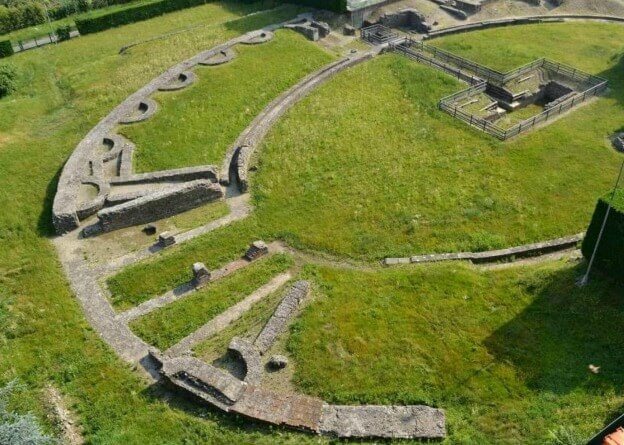 Have you visited any Roman site in Piedmont?